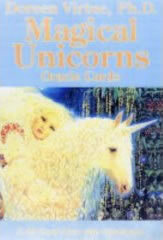 This title helps you begin each morning by communing with your angels. 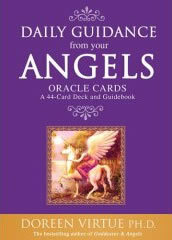 "Daily Guidance from Your Angels Oracle Cards" is a beautiful deck filled with 365 channelled meditations, each card offers comforting and uplifting messages, to set a positive and healing tone for the day. This deck also functions as a divination tool, so you can ask a question and select a card at random to a message that gives you guidance and answers. These cards are designed to help you stay centered in peacefulness throughout the day, and to remember that your angels are always beside you, ready to help you with every area of your life. An ideal gift, this set of cards can be referred to each morning and evening. 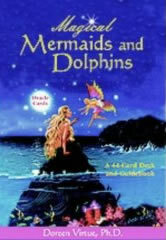 The Magical Mermaids and Dolphins Oracle Cards are specifically designed to help you manifest your goals, life purpose, and divinely inspired dreams. These beautifully illustrated cards can help you swim into the ocean of your unconscious mind, where profound thoughts and feelings can create, or block, your heart's desire. The cards are easy to use, and the enclosed guidebook will help you perform amazingly accurate readings for yourself or others. Doreen Virtue has created a nondenominational deck of "Saints and Angels" oracle cards that people from various spiritual and religious backgrounds are sure to appreciate and enjoy. Now you can easily receive messages and guidance from beloved figures such as Mother Teresa, Bernadette, Joan of Arc, Hildegard, Padre Pio, Anthony, Francis, and Bridget. Forty-four cards with breathtaking artwork depicting God, the Holy Spirit, Jesus, saints, archangels and guardian angels give you answers, gentle guidance, and messages. 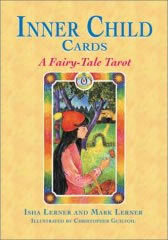 A guidebook accompanying the cards thoroughly explains how to receive guidance about the present and future, how to give an accurate reading to another person, and the general meanings of each card's message. By popular demand, Doreen Virtue has created a beautiful deck of cards based on her best-selling book "Archangels & Ascended Masters". The deck includes gorgeous paintings of 44 male and female cross-cultural deities, such as Ganesha, Merlin, Saint-Germain, Apollo, Pallas Athena, White Buffalo Calf Woman, Jesus, Moses, Yogananda, Green Man, and Kuthumi. 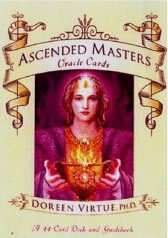 The enclosed guidebook gives expanded explanations of each card's meaning, and a brief history of each ascended master. 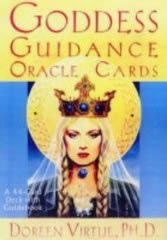 As with each of Doreen's oracle-card decks, the messages for each card are positive, accurate, and life-affirming. Your guardian angels have messages that can help you heal every area of your life! 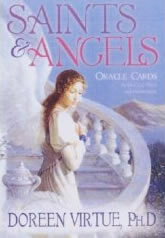 This set of 44 healing with the angels oracle cards will help you communicate with your angels; and receive angelic answers and guidance about your love life, career, health, family, and more. With the help of the enclosed guidebook, you'll learn how to give angel readings for yourself and your loved ones. 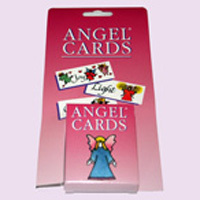 Each card features a beautiful angel image and message. There are no negative cards in this deck, since the angels always counsel us from a place of love. The powerful, wise, and loving goddesses want to help you to realize your full potential! The 44 goddess guidance cards in this deck will help answer your questions and give you guidance about personal and spiritual growth. The goddesses are from Celtic, Egyptian, African, Judeo-Christian, Buddhist, and other cultures, and they work beautifully with your angels and fit in with any spiritual path. With the gorgeous artwork and enclosed guidebook, you'll get to know these goddesses intimately. You’ll form relationships with Quan Yin, Green Tara, Lakshmi, and other benevolent deities; and you’ll find out whom to call upon for specific issues. Doreen Virtue has created this easy-to-use deck to help you give accurate readings for yourself and others. This Messages from the Angels card deck makes it easier than ever to give an amazingly accurate angel reading for yourself or others. 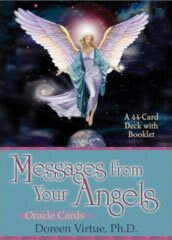 Each card features a gorgeous angel painting, along with a one or two sentence message. These cards will help you and others know what your exact life purpose is, whether someone is your soulmate or not, what to do about your job and living situations, and other important life questions. Includes a 44 card deck and an accompanying guidebook. 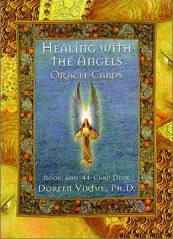 Doreen Virtue delivers powerful, comforting, and inspiring messages from the angelic realm. Topics addressed include: life's purpose, love life, children, self-employment, finances and abundance, health and healing, finding courage, peace of mind, and the spiritual path. 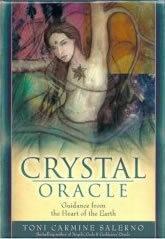 The Crystal Oracle has 44 full-colour cards with photographs of crystals and minerals. Each crystal is named on the card, and they include rose quartz to agates to gold. Packaged in sturdy cardboard case with a 44-page companion booklet. The Celtic Oracle explores Celtic magic and this fascinating culture, in particular the ancient Celts of Ireland and the islands. Inspired by Celtic legend, this larger-than-average deck bears symbols and icons significant to their unique history. A.E. Waite was a celebrated writer on occult topics who first created his tarot pack in 1910, with cards designed by Pamela Colman according to his instructions. The 78-card deck is now almost certainly the most widely used in the world, and it remains as popular as ever. The Original Rider Waite Tarot Deck and the book The Key to the Tarot can also be purchased separately, and if you browse under "Tarot" you will find several other related Rider publications. The pictures are beautifully drawn and have a lovely character but also manage to maintain a universal appeal. In almost every picture you will recognize the influence of the Rider Waite Tarot but these cards have added to and enriched these original meanings rather than plagiarized them. The Tarot of the Witches deck designed by Fergus Hall and featured in the James Bond movie Live and Let Die. The cards depict dreamlike fantasies with bold colors and fanciful paintings. The 78 divination arcana realised with tempera on papyrus are the key to understanding egyptian magic. Reproduction of the 78-card tarot deck in the book Practical Astrology by Comte C. de Saint-Germain. The symbolism of each card draws from Egyptian mythology and culture. 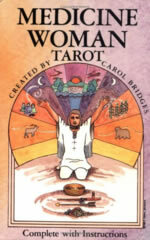 There are a plethora of tarot decks and kits available today. 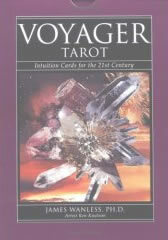 What distinguishes this Voyager tarot kit from the others is that it encourages the user to be proactive and to use intuition to change the future. Wanless encourages the user to not accept the future as a given, but as something that individual actions can alter. Accessible and easy-to-use, The Voyager Tarot is an excellent decision-making guide that can help you navigate through life, enhance business planning, relationship building, and self-discovery. Are dragons real? Since they do not live on the physical plane, scientists cannot dissect them. Yet magicians and psychics who have explored the astral realms know that dragons exist. Because of their ancient wisdom, dragons are valuable contacts to call upon when performing any type of divination. This Celtic Dragon pack uses the potent energies of dragons for divination, magickal spell working and meditation. The Lord of the Rings tarot, by tarot & folklore expert Terry Donaldson, skilfully weaves Middle-earth & all it's characters and fanciful places into a tarot system that will delight both Tolkien fans and tarot aficionados. Donaldson's discussion of the cards wends through Tolkien's works, traditional tarot interpretations, astrological associations, & original spreads and meditations. The Lord of the Rings tarot is the ultimate guide for all visitors exploring Middle-earth via the tarot. The Robin Wood Tarot is flavoured with vibrant nature imagery and luminous energies that enchant and stimulate Pagans and non-Pagans alike. The shining strength of this Tarot deck lies in it's depiction of the Minor Arcana. Unlike other decks, in which you sense that the artist may have found the Minor cards just a little repetitive, all of the cards in Robin Wood's deck spring into pulsating life. Even the novice reader will find these cards easy to understand and enjoyable to interpret. Radiantly colourful and infinitely captivating, this deck is a gift to your visual and psychic senses. 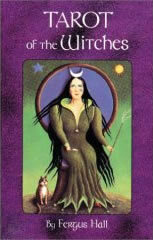 The Morgan-Greer Tarot was created by the artist Bill Greer under the direction of Lloyd Morgan. Greer was inspired by the images on the Rider-Waite deck and the work of Paul Foster Case. There are no borders on the cards which makes the images seem larger. Only the major arcana and court cards have titles. 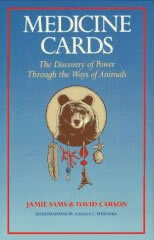 Drawing on ancient wisdom and tradition to teach the healing medicine of animals, this Medicine Cards book and card pack is a divination system that aims to provide an insight into, and an understanding of, the purpose of daily life. 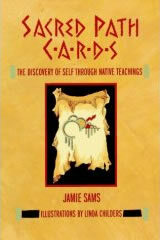 Sacred Path Cards: This pack contains illustrated cards and a guidebook based on Native American sacred teachings. The book and accompanying cards are designed to capture the strength and beauty of tribal traditions and offer the reader a tool for self-discovery, awareness and positive change. 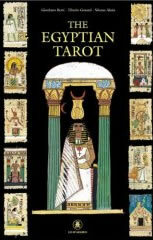 The tarot can be approached as a "book of life", and the explanatory book aims to enable anyone to read the cards. The images are simpler than the more obscure symbolism of traditional tarot, which needs a "reader" to interpret. 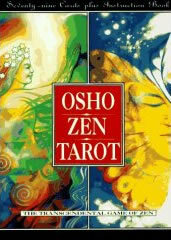 The book explains how best to work with the energy of the cards, and includes Zen anecdotes and stories by Osho to illuminate the essential of each card, and to help even those who are unfamiliar with the teachings of Zen to understand their meanings. 'Try to hate somebody consciously and you will find it impossible. Either consciousness disappears, then you can hate; or if you are conscious, hate disappears. They can't exist together. Light and darkness cannot exist together , because darkness is nothing but the absence of light.' Osho For centuries the teachings of the Buddha have been passed down from one generation to the next in a poetic form known in the East as sutras; the smallest possible number of words packed with the greatest possible meaning. Once the meaning is understood, just reading the words of the sutra can provoke a profound sense of peace and relaxation. 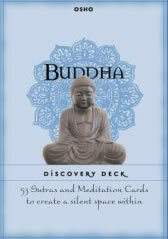 This boxed set of cards and book can be used as a daily meditation tool. A different card is chosen from the deck each day, and carried or displayed where the user can refer to it often. The front of each card contains a photo of a Buddha statue, and the words of a sutra from the collection of Buddha teachings known as the Dhammapada. The back of the card carries Osho's insightful and contemporary commentary, unfolding the telegraphic message of the sutra in a language that can be understood today. The book further explains the origins of these essential teachings of the Buddha, and supports a deeper understanding that will help the reader gain the most benefit from using the cards.